A woman quietly sits on a stage while audience members are invited, one by one, to pick up scissors and cut off pieces of her clothing. First performed in 1964 in Kyoto, the ambiguity of Yoko Ono’s Cut Piece left it open to many interpretations, including a protest for peace and against the Vietnam War. More than a half century later, this symbol of the oppressed is just as relevant today—and the inspiration for the Zuckerman Museum of Art’s new exhibition, Louder than Words. What made you interested in the scrapbook form? Victorian scrapbooks were mainly done by anonymous women as a pastime, but there’s this obsessive nature to them. They were probably constantly searching for material to put in their scrapbooks: books, cards, greeting cards, anything. The way they arranged the pages was quite beautiful, intricate, and, in many ways, very intelligent and unexpected. Why did scrapbooks seem like the right medium to articulate environmental anxiety? I was thinking about contemporary society and things that are frustrating. My work in general isn’t political, but I am very concerned about the environment. It’s hard to feel as an individual that you have a voice in the environment. You can vote and protest, but still, day to day, it feels like you’re running on a gerbil wheel. In my work, in general, I deal with obsessiveness. 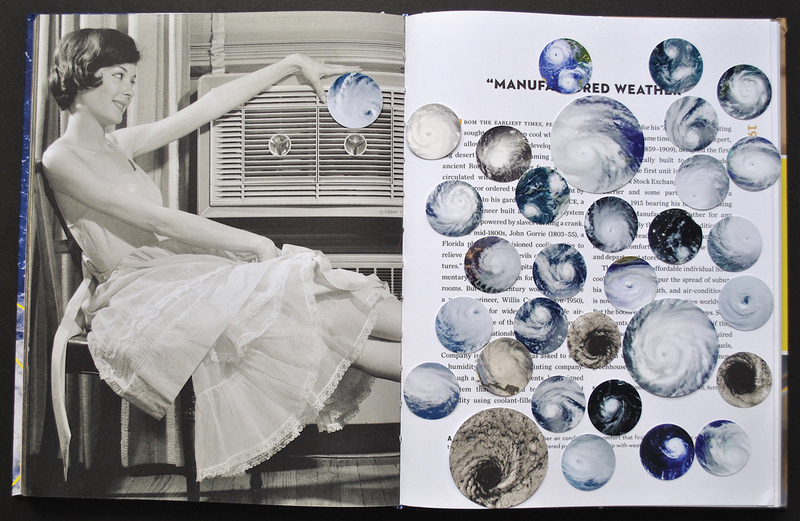 I’ll bring two things together, like books and magazines that dealt directly with the environment and fashion books. I put images of what [society, including the fashion industry] is doing to the environment into the books. It looks beautiful at first, but if you look deeper, it looks very dark. What do you hope viewers will take from this work? Climate change is something that we all know is an issue, but there’s a part of this that feels sort of defeatist. There’s also this hope that maybe these books will be seen in other places. They’re reminders to do something, to try. I hope it will make a impression when people go to vote or make decisions about daily lives, that they can do something. Europe has a strong tradition of wordless storytelling through comics, a style Sipp used to create a graphic novel on the French-Algerian War, one of the first modern wars mounted by insurgents. Without words, a viewer is able to bring their own experience and interpretation to the 25 pieces in the exhibition. “Humans want to create order out of chaos, so this gives the audience more ownership to develop the story,” Sipp says. What got you interested in this wordless comic form of storytelling? Twentieth-century Europe has a strong tradition of storytelling through wordless novels and comics. The narrative is implied in the visual association of the book itself. We approach art from the perspective of our own experiences, and we bring those to the table anytime we experience an art event. I started scripting it with a full narrative but realized making it wordless would allow the audience to participate and create their own stories. Why focus on the French-Algerian War? I watched The Battle of Algiers, which was filmed immediately after the war with only one actor and real French soldiers. I find this type of cinema verité really fascinating. The French-Algerian War was one of the first that involved insurgents. Individuals, just as much as armies, participated in this door-to-door combat; it was very nasty. What we view on the nightly news now is all the same thing. I had the story idea immediately. It’s about an American expat who flees a murder charge in Missouri and goes off to join the French Foreign Legion. It’s an adventure, war epic, love story. But the war is not a topic the French government likes to talk about. I went through archives, watched old film clips. I would freeze-frame these short films; then, print, expand in PhotoShop, and manipulate them on my computer; then, draw from there. You’re also one the few people drawing on glass. How challenging is this medium? Working on glass is a bit more ephemeral. It’s more about angles and telling the story in a more filmic way. 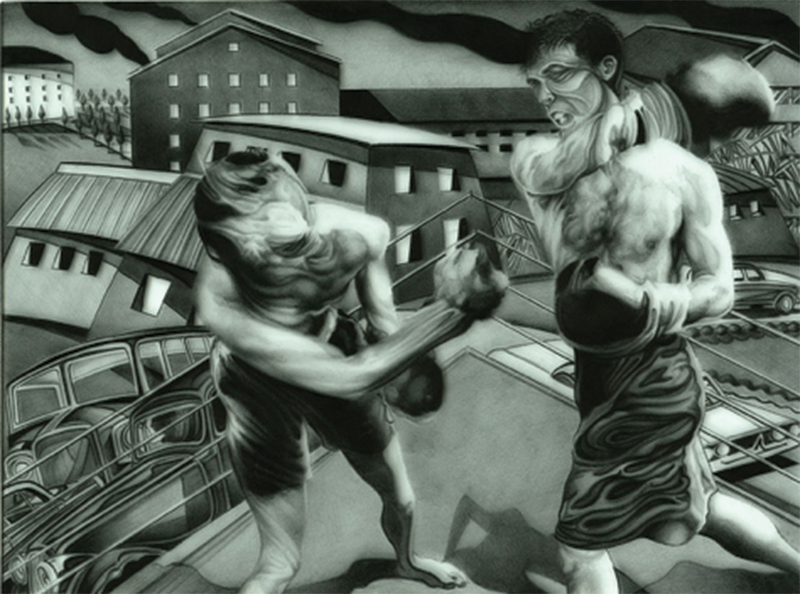 I grain the glass with grit like one would grain a litho stone. It creates this milky, cloudy surface that light can pass through. Each piece takes two and a half weeks or 40 to 50 hours to draw because, in order to build up the richness and saturation of tones, I need a super-sharp pencil and must do it slowly. The pieces are 14×19 inches and reasonably heavy, but quite fragile. Looking at them is a very personal experience. How would you characterize your work overall? I do a lot of work that deals with sound, sensation, sensory memories; works that physically affect bodies to create a heightened sense of self-awareness in a place. I look at how those sensations can help create memories, because memory is a sensorial thing. How did you develop this piece? 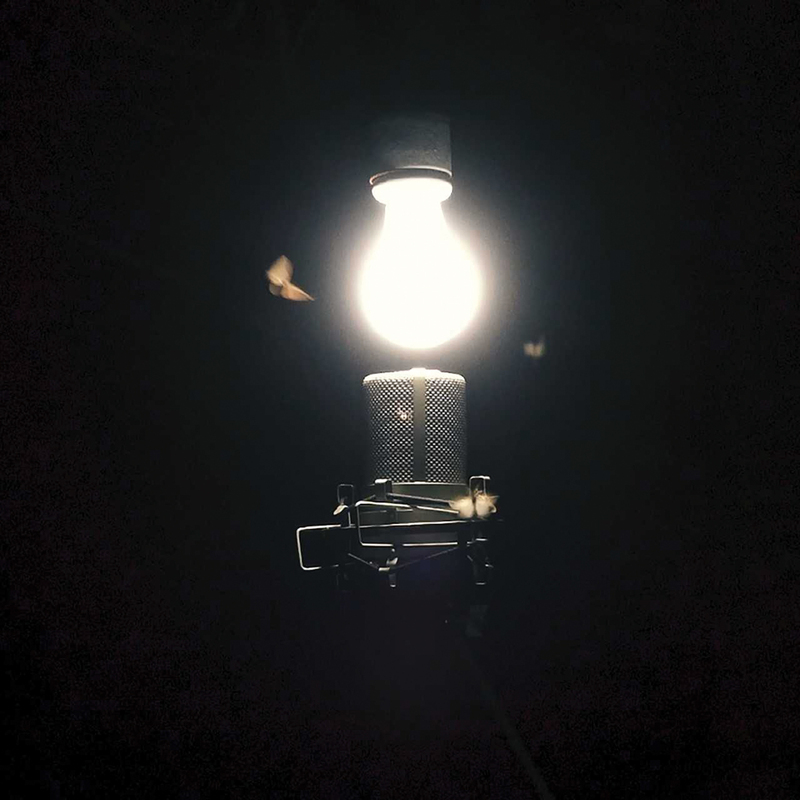 I ran a light bulb into the middle of woods, and under it, I set up very sensitive video cameras to capture moths and forest bugs flying at the light bulb. The microphone picks up air displacement as they approach this light bulb. I turn the audio signal into physical vibrations. It’s a 45-minute video of moths, and the seating I’m working on vibrates intensely in accordance to moth wings. What do you hope the viewer takes from it? It’s a sculpture about memory construction. Growing up in the South, there’s this very Southern moment sitting on the back porch just watching bugs. It’s a really nostalgic memory for me, but I’ve been thinking lately of how nostalgia and memory are all these constructed moments. In this political climate, it’s easy to retreat to these happy moments, but they’re not always real and not always good. Like, “Make America Great Again” is dangerously nostalgic for certain people. I am kind of flirting a line between making sensorial positive experiences that feel like something then snapping out with overstimulation and heightened moments. It’s nice to have comfort in these moments, but you can’t live in them, and you have to live in present moments and make decisions. Running February 2 through May 5, Louder than Words includes performances, sculptures, paintings, and video installations.